The Pennsylvania-truss bridge slated for replacement is considered a historic structure on the American side of the border, though not by the Canadian government. Construction began in June 2018 on the three-year, $39.3 million Baudette-Rainy River International Bridge Replacement project at the U.S.-Canada border, a joint venture of the Minnesota Department of Transportation and the Ministry of Transport–Ontario (MTO) headed up by Lunda Construction Co. The existing 1,283-ft., six-span steel truss bridge over the Rainy River, consisting of one lane in each direction with a 5.9-ft.-wide sidewalk, was built in 1960 by Barnett-McQueen Ltd. and links Baudette, Minn. (Highway 72), and Rainy River, Ontario (Highway 11). Customs plazas are located on either side of the bridge, which operate 24/7 throughout the year. The new 1,350-ft., five-span, I-girder (haunched continuous steel) bridge will have two-lanes in each direction and a sidewalk/bike path on one side. Motorists will continue to use the existing bridge while the new one is constructed just east of the current structure. The new bridge is expected to open in 2020, at which point the old bridge will be torn down. The new bridge will provide a safer and longer-lasting structure, a smoother and longer lasting bridge deck, a safer walkway for pedestrians and shoulders for bicyclists, according to MnDOT. "This bridge is reaching the end of its useful life," said Joe McKinnon, MnDOT's District 2 planner. "It is currently classified as structurally deficient. It can support normal weight loads but is not permitted to carry overweight loads or over-dimensional loads. "As a safety feature, our bridges are designed with redundancy built into the substructure. This redundancy allows the bridge to continue to carry loads after the failure of any of its components." In addition to commercial traffic, the bridge also is important to local and tourist traffic. "It is also the only border crossing for 50 miles in either direction," said McKinnon. "This portion of the Rainy River is approximately 1,200 feet wide. It is also a popular fishing spot year-round. Construction is limited during sturgeon spawning times, and provisions are being made during construction to allow for fishing boat traffic safety." Even though the partners could split all of the costs, they couldn't split all of the work. The design work was done collaboratively, but other processes needed to be done separately. "The environmental assessment can be a long process by itself," said McKinnon. "But both countries require their own version of environmental approvals, so it was like doing it twice." Another difference was historic considerations. The original steel bridge is a rare example of a Pennsylvania truss, which made it eligible for listing in the National Register of Historic Places. U.S. law requires that any state proposing demolition of a historic bridge must inform a responsible government or other entity of its availability for preservation and relocation. However, Canadian authorities did not consider the bridge historic. Equipment used in the project includes a Manitowoc 2250 crane and an assortment of barges. "Because of its historic designation we had to try and offer the bridge for sale," said McKinnon. "But since ownership of the bridge is split with Canada, we were actually advertising only half of a bridge for sale. The advertising for the chance to buy half of a bridge created a stir online and in the media, but it didn't generate any interested parties due to the considerable costs to disassemble, move and reassemble." The need for international coordination added an extra year or two to the project schedule. Along with the Canadian permit requirements, project staff also had to deal with the Minnesota Department of Natural Resources, the U.S. Army Corps of Engineers, the U.S. Coast Guard, the International Joint Commission and the International Boundary Commission. Stantec, engineering services company based in Edmonton, Alberta, produced the preliminary and environmental designs, and the Parsons Transportation Group of Washington, D.C., developed the final bridge design. These efforts were coordinated with 90 stakeholders to address environmental, construction, and border control concerns, as well as historical concerns and the public participation process. "The design is a typical steel-girder and cast-in-place concrete deck," said McKinnon. "The reinforcing steel in the deck will be stainless steel as an effort to create a longer lifespan of the deck surface life, before a deck rehabilitation project would need to be done in the future." Both DOTs expect the traffic impacts to be minimal, as construction materials and equipment are delivered to the work sites via side roads and a temporary causeway is used to advance construction. "Thru traffic will be maintained during the construction project," said McKinnon. "The setting is unique with the Canadian and United States port-of-entry sites at each end of the bridge. These facilities are not being updated or improved as part of the bridge project. Access for vehicles to the POEs has to be maintained and only short delays in traffic are permitted." Keeping the public informed about the project has been crucial, and five meetings have been held since 2015 to discuss the bridge design, construction, environmental impacts and traffic plan. Since the construction began, weekly project update meetings have been held at the U.S. border office. "Keeping the public informed is important as the bridge is in the backyards of Baudette and Rainy River, so those communities should be in the communication loop," said McKinnon. "The new bridge will look very different than the original truss bridge. They will have that view for a very long time." Work on the abutments on the Ontario shoreline began in 2018 and will continue at the start of this year's construction season. The 2019 work will focus on the abutments, including those on the American side, and installation of the four piers. In 2020 crews will begin placing the steel beams for the bridge deck, pouring the concrete deck and constructing new road approaches on the Minnesota and Ontario sides. Weather permitting, demolition of the old bridge will start immediately after the switch and should be completed in three to four months. 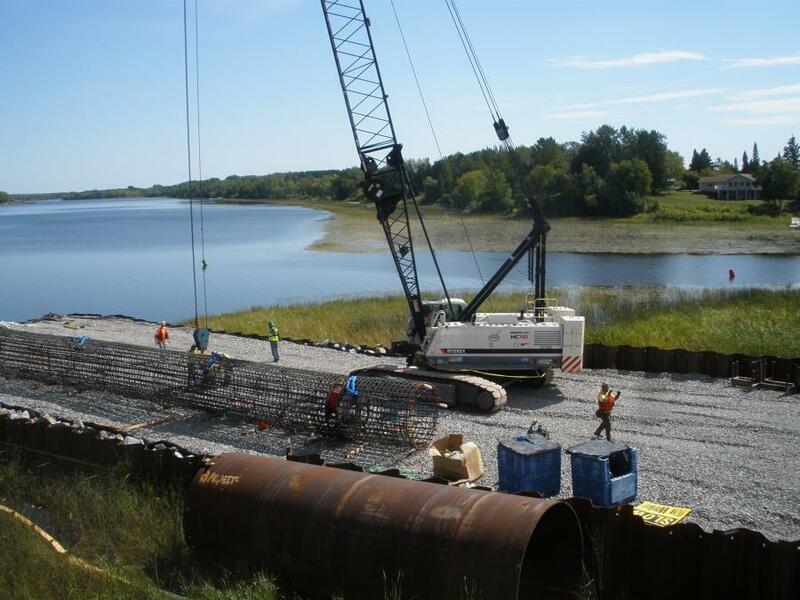 Lunda built a 250-ft. temporary causeway into the river on the Minnesota side during the summer of 2018 to provide a work space to help construct the bridge abutments and piers. The plan was to begin construction of the pier footings and pier stems, but progress was ultimately hampered by the discovery of cobbles and boulders. "For this project crews will be drilling instead of pile driving because the amount of rocks in the soils," stated the project webpage. Cory Spanier, the project manager for Lunda Construction, is being assisted by Josh Lang, a Lunda's project superintendent. The 2018 season concluded around the beginning of Thanksgiving, and the 2019 season is expected to begin in April. While there is a possibility that the installation of the steel for the deck will start in the fall, it most likely will commence in the spring of 2020, along with the pouring of the concrete deck and 1,000 ft. of concrete road to link the highways to the new bridge. Cranes lift the casing for a drilled shaft. "The main challenge has been dealing with the drilled shafts and how we're going to improve the efficiencies of construction by using them," said Shawn Groven, MnDOT's project manager. 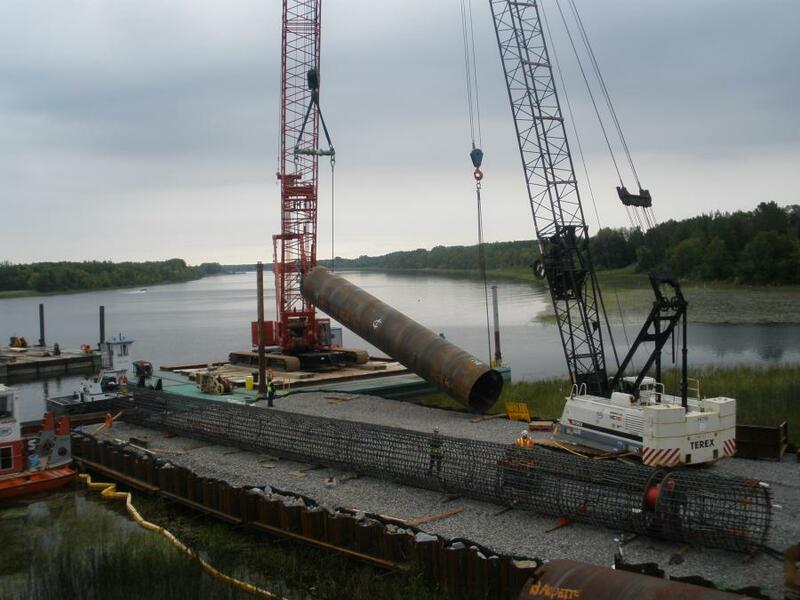 "We have driven pile on the Canadian side and the construction of the abutments on that side went well. For 2019 the biggest thing is to get the substructures built." So far, the schedule has been based on day shifts. Lunda has put together a comprehensive safety plan that has workers wearing lifejackets and all appropriate safety devices. Safety drills have been conducted to quickly retrieve anyone who has fallen into the cold water. No utility issues are anticipated during the construction. "It's a tight area as both customs buildings are right off of the bridge, so Lunda is utilizing the limited space available as best they can," Groven said. "They are working with Baudette to secure a property to set up the field lot and construction office. Deliveries will be on an as-needed basis, and when it's time to install the structural steel, an area will be prepared so that it can be unloaded and installed rapidly." Lunda has developed a plan and schedule and has set benchmarks. "We've developed a good working relationship, along with weekly meetings to keep everyone informed and moving forward," said Groven. "They've been really timely with their submittals, drawings, and so forth." The DOTs are working closely with Lunda to ensure that the project stays on budget and schedule. 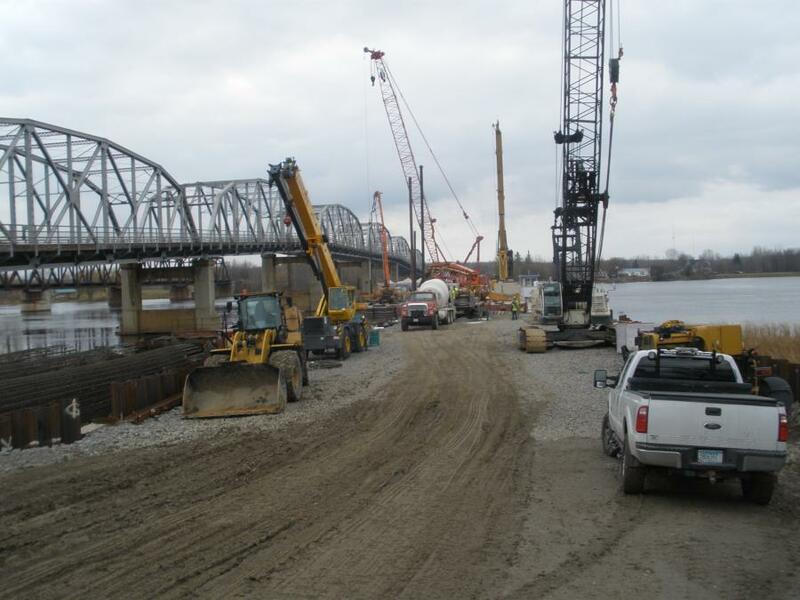 Crews are working on both sides of the bridge, with Facca Inc., based in Ruscom Station, Ontario, responsible for the abutments and pile driving on the Canadian side. On the American side, Lunda is taking care of the abutments. Veit & Company Inc., which has employees in both countries, was hired to do the drilled shafts. Lunda made arrangements with customs officials to allow for considerable freedom of movement of personnel, equipment and building materials across the border. Customs officials also attend the weekly meetings to keep abreast of the upcoming work. 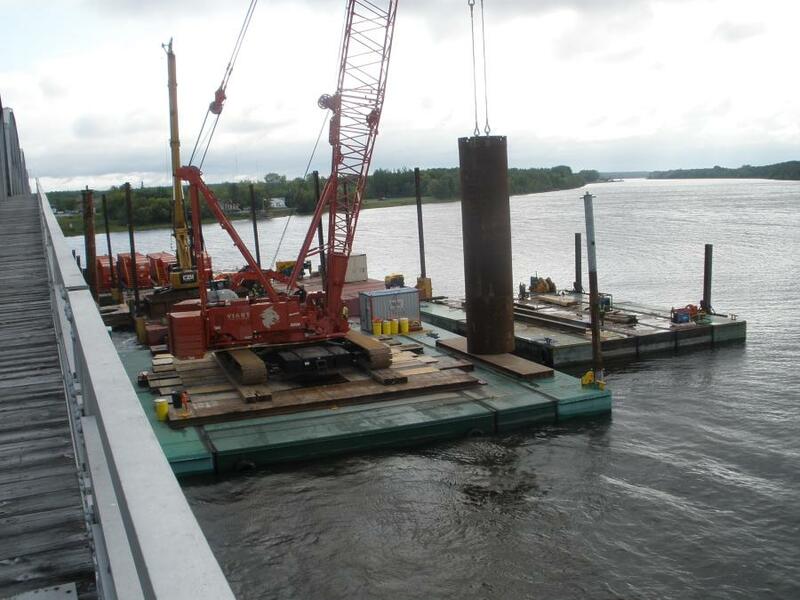 The construction of the causeway — sheet pile, encased with riprap — began in mid-June and was completed July 28. All the abutments should be done by the time the piers are completed. "The plan of attack is to concentrate on the drill shafts," said Groven. "The abutment work will essentially be fill-in operations." Work on the piers is expected to start in May and should be completed this fall. "We haven't gotten a good handle or feel for the drilling rates for the drill shaft," said Groven. "They built a technique shaft [a test shaft], and they have eight remaining drill shafts to go. Depending on the conditions, if they start on pier one, they will get the barges out as soon as they can." The drilled shafts could range from 80 to 115 ft. deep. "After they drill, they'll set the rebar cage," said Groven. "There is a rebar integrity profile with layers and instrumentation attached to the cages that gives you a shape of the drill shaft. Once the concrete is poured, it gives you the shape of how jagged it is relative to the rebar. The density of the concrete has to be more than the density of the soils." Five Lunda barge spreads are being used — a crane barge, a drill rig barge, one barge with five Adler frac tanks, and two barges for drilled shaft spoils management. Barges also will be employed to help with the placement of the steel beams for the substructure, which should include the setting up of a temporary shoring tower to help with the work. The 2020 construction season will be busy as the deck has to be poured and the old bridge demolished. Lunda, to meet its schedule, can put in requests to do some night operations. It also has a ready-mix plant about 3 mi. from the work site, which makes for rapid deliveries of concrete and quick pours. Groven expects that demolition work will see the truss of the old bridge removed first, followed by the substructure. Meanwhile, environmental regulations, which do not permit debris from entering the river, are complicating the schedule. Workers prepare to lift a rebar cage for a drilled shaft. "Lunda has put together a construction site plan to address the work they are doing in the water," said Groven, "and due to fish spawning, there are requirements in the contract that they can't do anything in the water without approval and that there cannot be any disruptions in the water from March 15 to May 1." The construction of the new road approaches, with two lanes in each direction, should be completed rapidly, just before the bridge is completed. MnDOT will have two inspectors on site as the project ramps up, along with Paul Konickson, an MnDOT project engineer, and MTO will have a project manager, Earl Warren, as well as personnel from Thunder Bay Testing to consult on the drill-shaft operations. "It's a unique and exciting project," said Groven, who expects to be visiting the work site often. "I've never dealt with drill shafts, and you have the international component, barge work, and demolition of the bridge." Peak days have seen 12 workers on site, and when work peaks in 2019, there will be approximately 25 workers there on a daily basis. Major subcontractors assisting Lunda on this project include Veit for the drilled shafts, FACCA for portions on the Canadian bridge structures, Danny's Construction Company for structural steel erection and Harris Davis Rebar for supply and installation of the reinforcing steel. New materials that Lunda will furnish and incorporate into the project include 3,660 cu. yds. of concrete, 1 million lbs. of reinforcing steel, 2,022 tons of structural steel, 730 cu. yds. of concrete pavement, and 792 linear ft. of 90- to 96-in. drilled shaft foundations. The following equipment is being assigned to the project: a Manitowoc 2250 crane and a Terex HC110 crane; a 145 Link-Belt excavator and a Volvo 220D excavator; one Cat 950M loader, and a large spread of Poseidon, Felxi Float and Shugart barges. The work has had its share of normal wear-and-tear issues, but Lunda mechanics have carried out repairs on site, and the company has devoted considerable resources to maintain the fleet. Lunda purchases equipment from local and regional dealerships.